Clean up the barracks’ parking lots, outdoor projects, etc. as a Command, shop, or other group. Please see your Unit SMP Representative for more information, or contact the SMP Coordinator for additional questions, project ideas, and tracking. 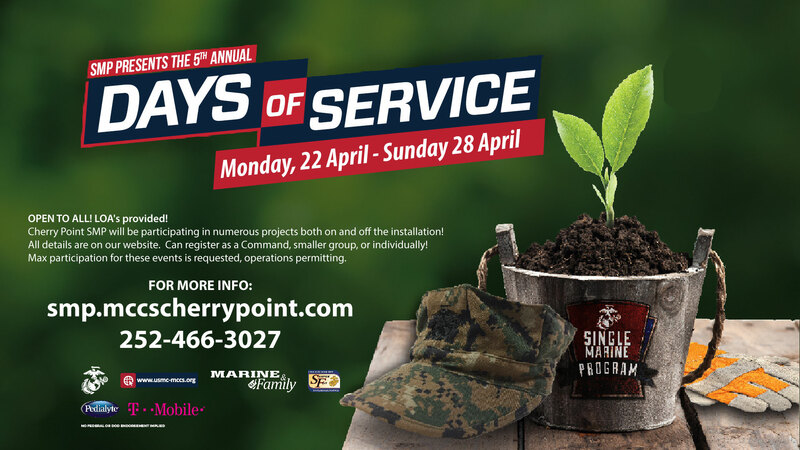 Due to the high volume of operations and training, the Base Clean-Up Opportunities are available at each Command’s day(s)/time(s) convenience during the SMP Days of Service (Monday, 22 April through Sunday, 28 April). We appreciate any and all assistance! SMP Days of Service Base Clean-Up blank rosters will be made available to each Command, prior to the SMP Days of Service. Letters of Appreciation will be provided to all participants. Please see ALMAR 007/19 regarding SMP Days of Service. SMP Representatives: If your Command is available and chooses to participate in a Base Clean-Up, please email the basic volunteer information (number of participants, date, times volunteered, and area covered) to the SMP Coordinator (KrivohlavyJL@usmc-mccs.org) by 2200 on Monday, 29 April. Please submit the detailed rosters to the SMP Coordinator NLT Friday, 3 May 2019 so that Letters of Appreciation may be completed in a timely manner.